Judgment Day… May 21, 2011????????????? 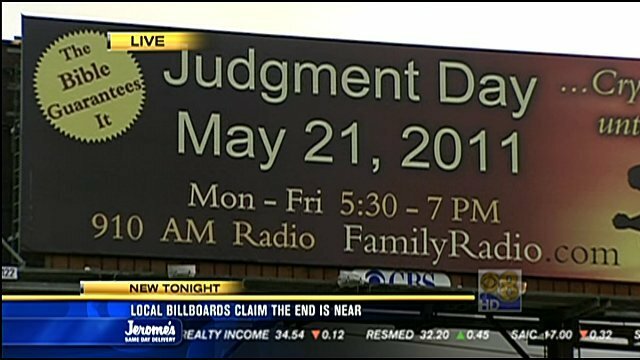 Take a close look at the sign below… “Judgment Day – May 21, 2011 – The Bible Guarantees It.” Are you serious? It is hard to believe that people would fall for something this ridiculous. Here is what the Bible does say about Jesus’ second coming… “Therefore watch, for you do not know either the day or the hour in which the Son of Man comes” – Matthew 25:13. If we are prayerfully studying the Word of God and have a genuine relationship with our Savior, Jesus Christ, we have nothing to fear. The Bible is crystal clear about what it takes to be saved. If we BELIEVE, we will be saved (John 3:16). What does it mean to believe? 2 Chronicles 7:14 says, “If My people, who are called by My name, shall humble themselves and pray, and seek My face, and turn from their wicked ways, then I will hear from Heaven and will forgive their sin and will heal their land (hearts, relationships, homes, churches, etc. ).” When we are SAVED… Jesus gives us all the wisdom, power, desire, and love we need to be victorious in our daily lives. When we are SAVED, it does not matter when Jesus returns to take His followers to heaven to be with Him. Because of this fact… please do not allow the devil to trick you into believing “his” END OF TIME lies. As Bible students, we know that the END IS NEAR. Jesus says in Revelation 22… “Behold, I come quickly” (Rev. 22:7). “And behold, I am coming quickly, and My reward is with Me, to give to each according as his work is” (Rev. 22:12). We may think God does not know what He is talking about when He says, “I come quickly!” For God, a thousand years is nothing… He has always been and will always be. When the time is right, Jesus will stand up and say, “It is finished!” Then and only then will He “descend from Heaven with a shout, with the voice of the archangel and with the trumpet of God. And the dead in Christ shall rise first. Then we who are alive and remain shall be caught up together with them in the clouds, to meet the Lord in the air. And so we shall ever be with the Lord” (1 Thess. 4:16,17). Should we be date setting and casting words of fear around us in these last days? NO! But we do need to be telling others of God’s amazing love and Jesus’ soon return? YES! If we do not do it, who will? Let us go back and reread Matthew 24 (and 25 while we are there) and pray that God will give us the desire to be filled with His Holy Spirit. As this happens… Acts 2 power will be displayed in our lives and those around us will know that we are disciples of Jesus. “No sooner does one come to Christ, than there is born in his heart a desire to make known to others what a precious friend he has found in Jesus; the saving and sanctifying truth cannot be shut up in his heart.” – Steps to Christ, p. 78. How will you share your faith today and every day? No matter what… let us make sure our ministry begins in the home. Another group has put up a billboard in Oakland and are debating Camping on their website…www.merkaba.org Does anyone know anything about them?